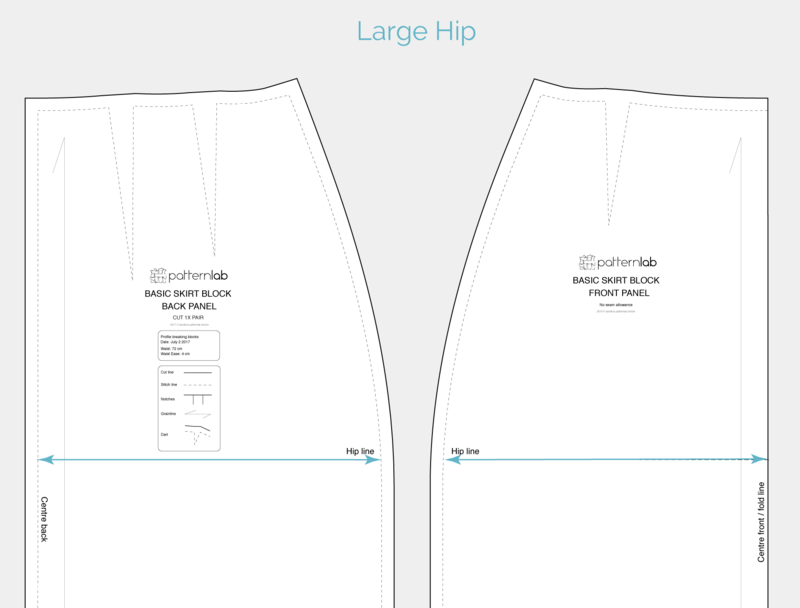 What does a proportionate Basic Skirt Block look like? The Basic Skirt Block is actually a very simple block to draft and it should not be hard to get an excellent draft first time, however, mistakes are made. There are only three or four measurements that might cause the block to become ill-fitting. We have used significantly large or small measurements to demonstrate this in each case. Although we use extreme cases, In reality, your block will most likely feature far more subtle fit issues. First, it is necessary to understand what a proportionate Basic Skirt Block looks like. The first image displays an ill-fitting or broken block, and the second image a well-fitting or proportionate block. The first block is broken because a selection of body measurements (blue lines) are either too large or too small, either from taking poor measurements or from carelessly entering measurement into the profile page. It’s necessary to spot these issues and fix them by revisiting the profile page and adjusting the incorrect measurements to create a more well-fitting and proportionate block. In this case, the block features a disproportionately large Hip measurement and a disproportionately short Waist to Hip measurement, causing the block to break significantly. The result, when toiled in fabric, would be an excess of material at the side seam, an unusual curve to the waistline and a hip line that would fall far higher up the body than expected. This block features a proportionate hip that creates a smooth, flattering curve from the side seam to the hip, that would be slightly more pronounced when the darts are closed. The upper portion of the block would fit well around the hips and waist due to a well proportioned Waist to Hip measurement. If you feel you have taken accurate measurements and have made no mistakes when entering them into the profile page, but you are still seeing issues with the fit of your block, you can always refer to our Standard size charts. Simply look for the size that closely matches your profile and then compare your ill-fitting measurement with the chart. If there is a big difference between the two, use a value similar to that on the chart. If the measurement is only out by a small amount, then it is possible that your measurement is correct but is being affected by another. + What does a proportionate basic skirt block look like? What measurements are used to draft the Basic Skirt Block? To understand how to spot and fix an ill-fitting or broken Basic Skirt Block, it is necessary to understand which measurements are used to draft the block and how each measurement affects the drafting process. Below is a diagram that aims to do just that. Please study it carefully. 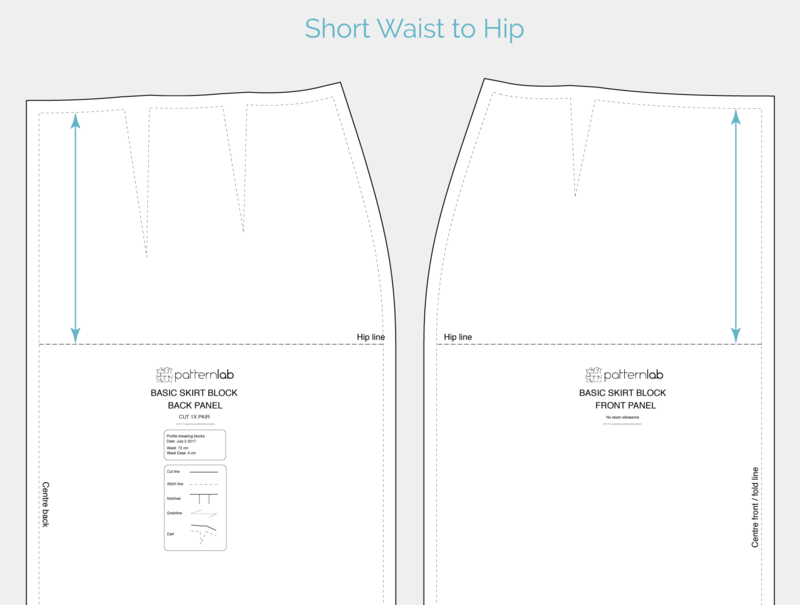 It will help when understanding which key areas are causing issues, allowing you to adjust specific measurements in the block preview tool, allowing you to redraft your pattern. 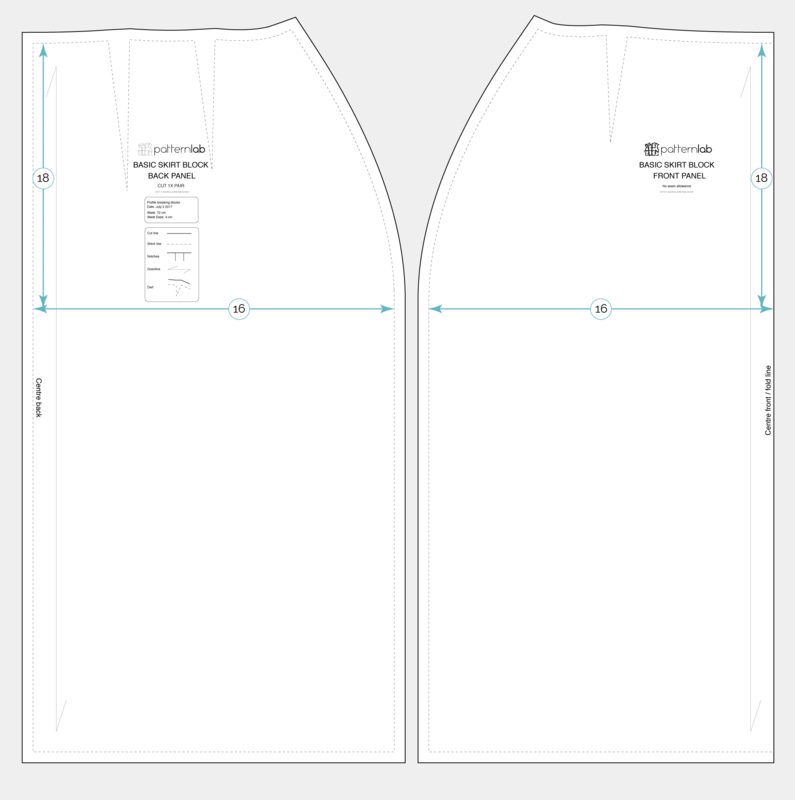 The waist is an important measurement when drafting the Basic Skirt Block. It controls how wide the skirt is around the waistline. It can either be too loose causing the skirt to gape at the waist or drop from your natural waist or be too tight causing fit problems when trying to close the skirt, bend or sit down. Below are some extreme examples of the Skirt block breaking due to this measurement and how to spot a potential issue with your own block. 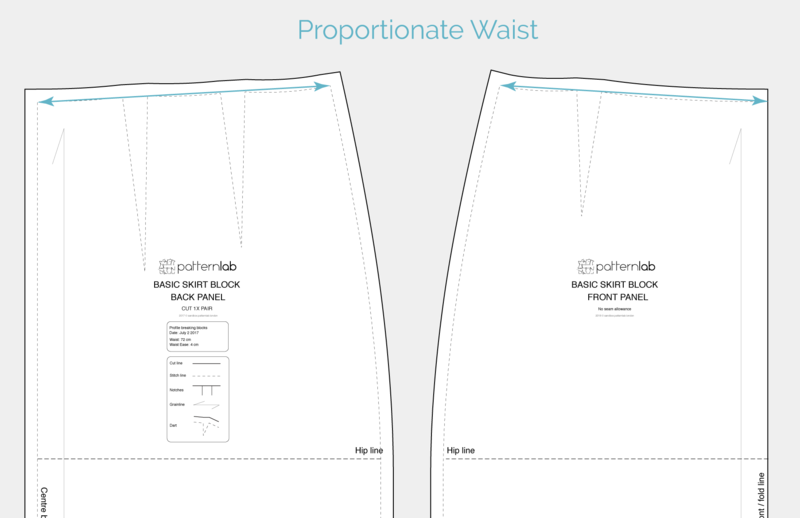 In this example the waist measurement is disproportionately large for the block, causing the skirt to appear almost straight! This means the skirt will gape at the waist and possibly fall from the hips. In this instance, check your existing measurement for errors and either remeasure or decrease your waist measurement until a more well-fitting block is drafted. 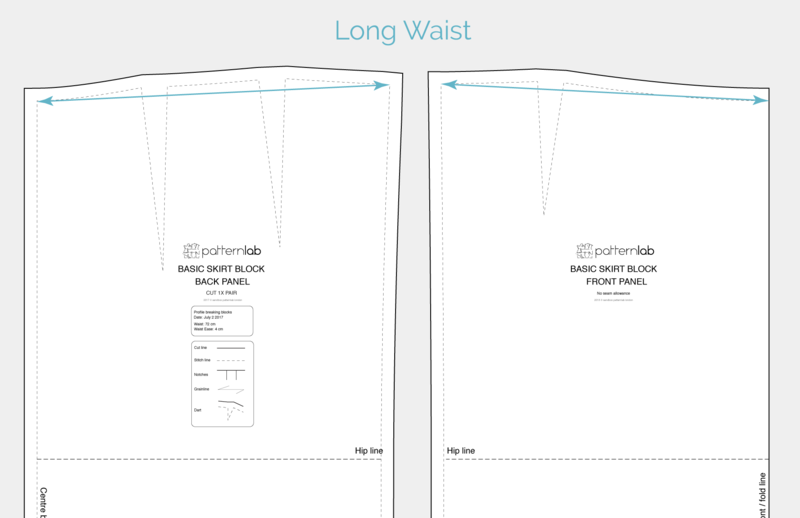 In this example, the waist measurement is disproportionately small for the rest of the block. Ideally the waist is meant to be smaller than the hips, however, if the waist is too small, the skirt will be too tight to fit around the models waist. In this instance, check your existing measurement for errors and either remeasure or increase your waist measurement until a more well fitting block is drafted. In this example, the waist measurement has been taken correctly and is proportionate to the rest of the block. Once constructed in fabric, this block will fit comfortably around the waist, creating a smooth curve from the waist to the hips and providing just the right amount of room for the model to sit and move. 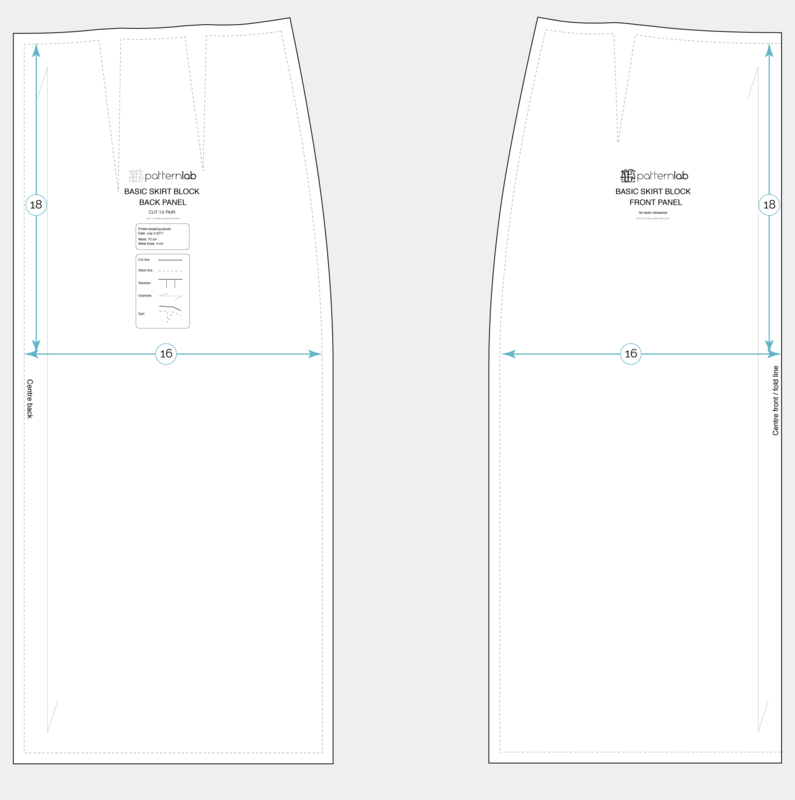 The Hip is yet another important measurement when drafting skirts. It controls how wide the skirt is around the hips or largest part of the lower body. It can either be too large causing the side seam to have an unnatural curve creating excess material at the side seam or it can be too tight preventing the model from wearing the skirt once toiled. Here are some extreme examples of the skirt block breaking due to this measurement and how to spot a potential issue with your own block. 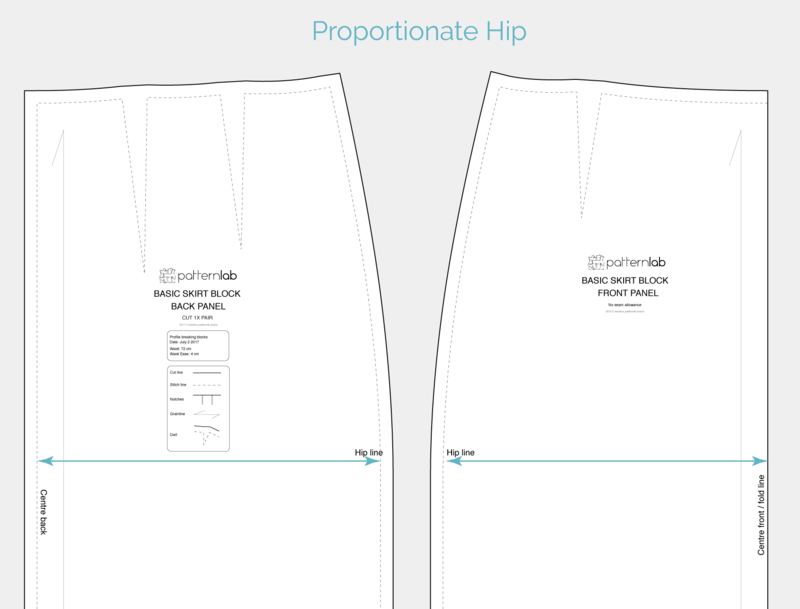 In this example, the hip measurement is disproportionately too large for the block creating an unnaturally curve over the hips, the waist curvature is acute at the side seam and the skirt will flap around at the hips and distort the skirt’s balance. In this instance, check your existing measurement for errors and either remeasure or reduce your measurement until a more well fitting block is drafted. 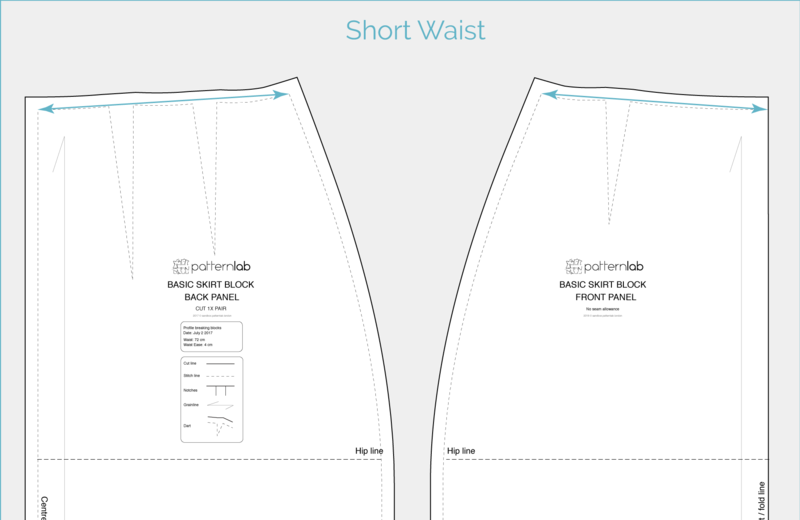 In this example, the hip measurement is disproportionately small for the block and the skirt will be far too tight to fit around the models abdomen, making the skirt unwearable. In this instance, check your existing measurement for errors and either remeasure or increase your measurement until a more well fitting block is drafted. In this example, the hip measurement has been taken correctly and is proportionate to the rest of the block. Once toiled, this block will fit comfortably around the waist and hips, creating a smooth curve over the hips and providing just the right amount of room for the model to sit and move. The Waist to Hip measurement dictates the length of the skirt from the waist to the hip. It also has some control over how subtle or dramatic the curve of the hip is at the side seam. Here are some extreme examples of the Skirt block breaking due to this measurement and how to spot a potential issue with your own block. In this example, the Waist to Hip measurement is disproportionately long for the block, causing the volume normally reserved for the hips to drop lower down the abdomen. 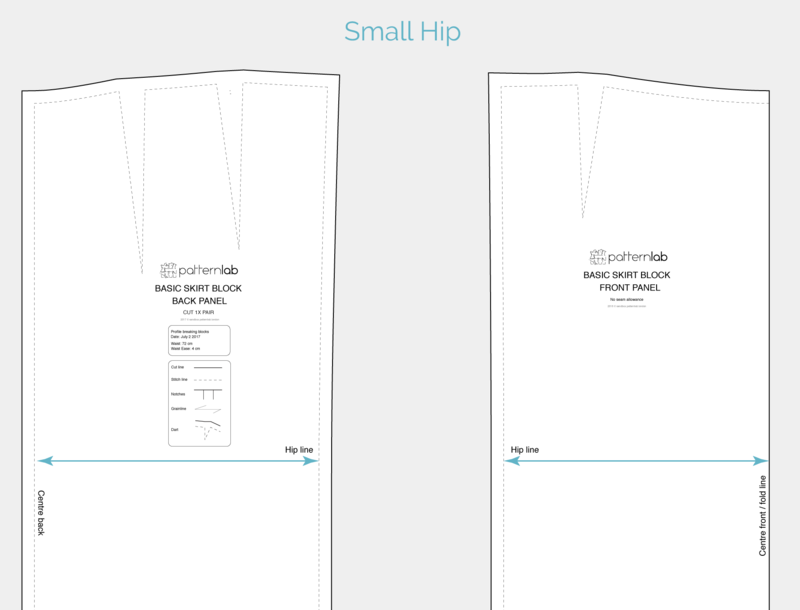 This could potentially create a tight fit around the hips even though the block might have an overall comfortable fit. This could cause the skirt to ride up and bunch above the hips. In this instance, check your existing measurement for errors and either remeasure or decrease your Waist to Hip measurement until a more well fitting block is drafted. In this example, the Waist to Hip measurement is disproportionately short for the rest of the block, causing the volume normally reserved for the hip to appear higher up the abdomen. The result is a skirt that seems boxy or have a sharp square fit at the side seams. In this instance, check your existing measurement for errors and either remeasure or increase your Waist to Hip measurement until a more well fitting block is drafted. 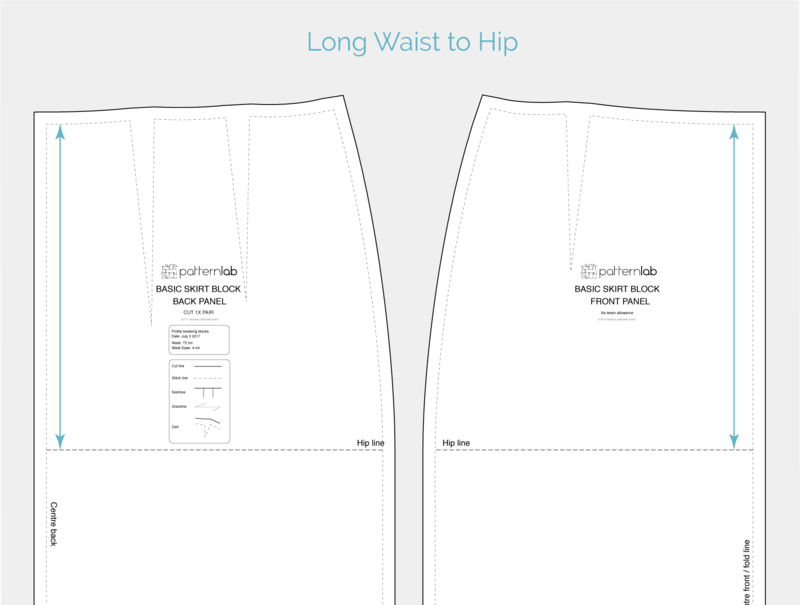 In this example, the Waist to Hip measurement has been taken correctly and is proportionate to the rest of the block. Once toiled, the skirt will fall comfortably over the side seam from the waist to hips and the skirt will not appear tight, ride up the abdomen or appear boxy. 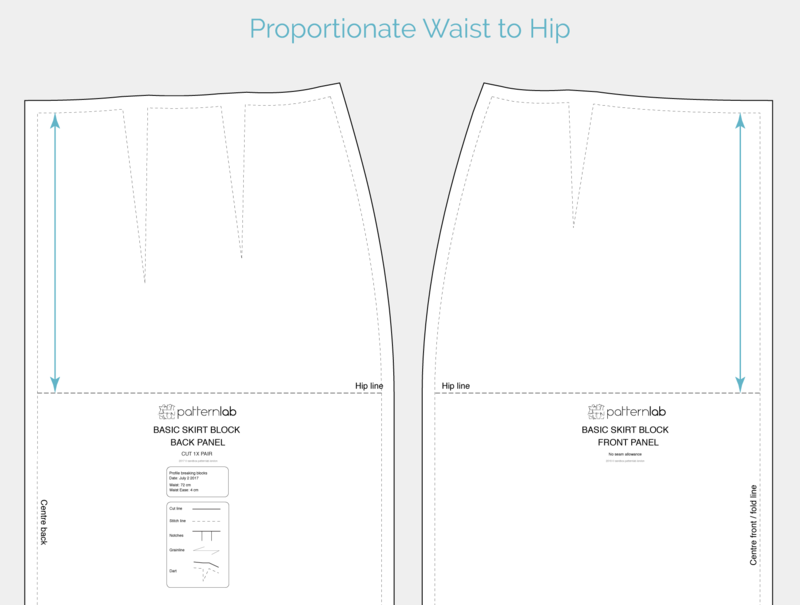 The block preview tool, allows you to edit or tweak your measurements as many times as you wish (Except the Bust, Waist, and Hip) to create a more well-fitting block. Once you have corrected and saved your measurements, the system will then redraft or update the block with your new measurements and create a new preview. You can find the block preview tool by navigating to ‘My Account> My Orders> View order> Preview’. Experiment either by remeasuring, increasing or decreasing incorrect measurements until a more proportionate block is drafted. Once you have a reliable profile, you’ll be drafting blocks that fit at the touch of a button! 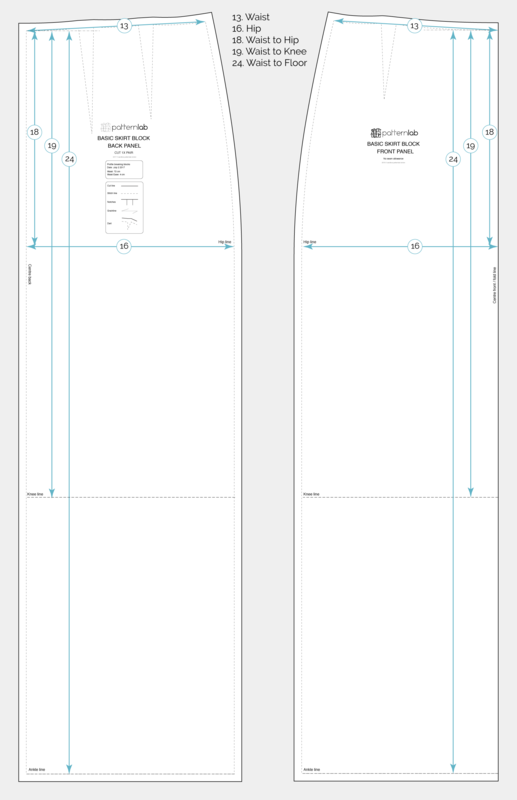 Don’t forget, some problems can be fixed by comparing your custom measurements with our standard size charts. They will help you understand how much you will need to increase or decrease your measurements.